WICHITA, Kan. (KSNW) - A 22-year-old Missouri man is in the Sedgwick County Jail accused of murder. Brandon Craig of Indepedence, Missouri, was booked on suspicion of first-degree murder. 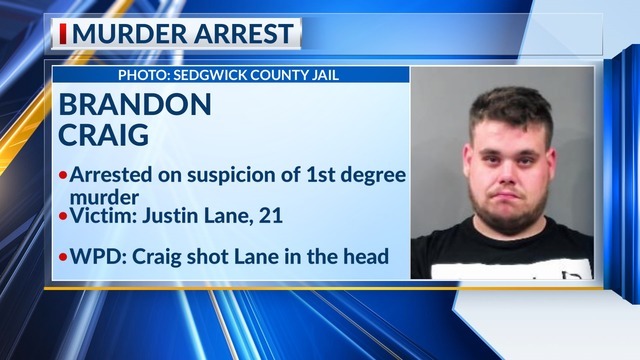 The Wichita Police Department said Craig and 21-year-old Justin Lane of Grain Valley, Missouri, were visiting a friend in the 800 block of South Emporia. Around 8:30 a.m. Friday, officers were called to the home. They found Lane dead from a gunshot wound. Police say from their investigation, they learned Craig and Lane got into a fight, and Craig shot Lane once in the head. The case is still under investigation. Once complete, police will turn it over to the Sedgwick County District Attorney's office for formal charges.